The entire town of Mendocino is designated a historical landmark and is the only town on the California Coast that is designated as a Historic Preservation District. Established in the 1850's, many of Mendocino's first residents came from Maine, so it is not surprising that the architecture resembles that of a New England village, with charming Saltbox cottages and stately Victorian mansions. 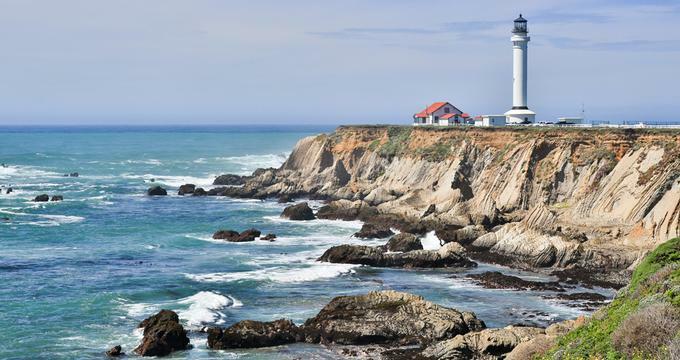 Here are the best things to do on the Mendocino Coast. 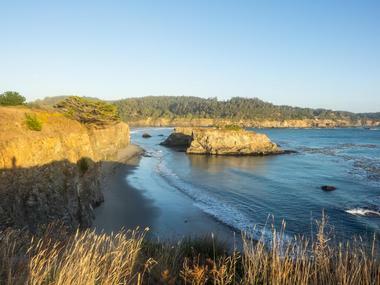 Mendocino Headlands State Park surrounds the picturesque Mendocino village on three sides - a breathtakingly beautiful mix of rugged coastline, romantic secluded beaches, gentle, scenic trails and so much history. Hiking along the cliff edge, visitors can enjoy stunning views of rock arches and dark, hidden grottos. In the spring, the trails are surrounded by wildflowers, crisp fall day offers the riot of leaf colors, and the winter presents hikers with the opportunity to see the migration of grey whales from a great vantage point. The headlands are very popular among photographers and artists who try to capture the magic of nature. The Visitors Center for the Mendocino Headlands State Park is located in the Historic Ford House on Mendocino's Main Street. 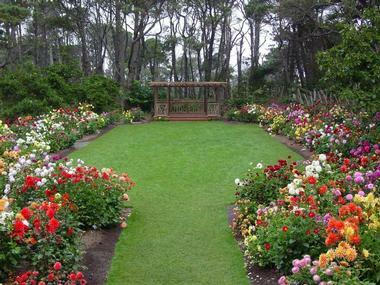 The Mendocino Coast Botanical Gardens sit on 47 acres of coastal land, amid canyons, wetlands, coastal bluffs, and closed-cone coniferous forests. The year-round moderate climate of the Mendocino coast allows the propagation of delicate plants that would not survive in extremes of heat and cold. The highlight of the gardens is the rhododendron collection, which has more than 125 species of the flowering shrub. 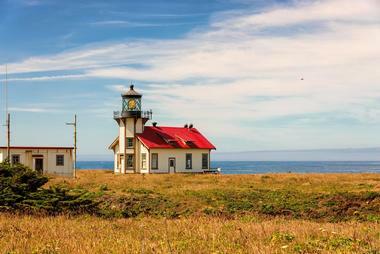 The Point Arena Lighthouse is an iconic landmark on California's northern coast. Dating back to 1908, the current lighthouse was built after the great earthquake of 1906 had damaged its predecessor beyond repair. The new lighthouse was built with reinforced steel rods encased in concrete in order to withstand future earthquakes. Glass Beach is located in Fort Bragg, California, about 120 miles from San Francisco, on the Mendocino Coast. The beach is one of the most fascinating beaches in the world, where each pebble is created of fine rounded, colorful pieces of glass. It is a very beautiful place where nature has turned human mistake into a true treasure. The legend says that every time a sailor is taken by the sea, the Mermaids cry, and their tears turn into a sea glass that is then washed up on the shore. The reality is much less romantic: Sea glass< comes from clearing of the debris from the destroyed city buildings– overwhelming amounts of it were dumped into the sea after the devastating 1906 San Francisco earthquake. The time and the power of the ocean slowly turned the broken windows and bottles into colorful treasures visitors come from great distances to collect. 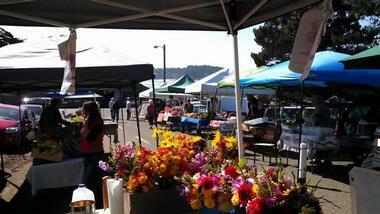 Visiting one of seven Mendocino County farmer's markets is a delight for all senses. Enjoy the colors, smells and textures of everything that comes from local farms, ranches and the sea. Only certified farmer's produce can be sold and each local market has its own specialties. You can find olives, pears, apples, peaches, greens of all kinds, naturally raised beef, buffalo, goats and pork. You can also find flowers, eggs, olive oil, handmade soaps, honey, wine, cheeses, baked goodies and so much more. There is always some kind of music in the background and it is easy to spend the whole day in the market. Many vendors offer samples and it is almost possible to fill yourself up before you spend a dime. It will also make you feel good to support local farmers and producers, to stock up on the freshest possible produce and feed your family with healthy, natural food. 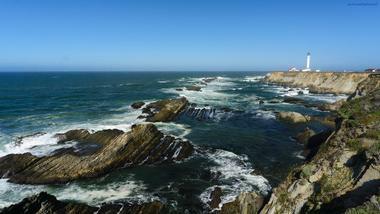 Point Cabrillo Light Station State Historic Park is located on a scenic headland that juts out into the Pacific Ocean. The Light Station was built in order to assist navigation for the ships carrying lumber at the end of the 19th and beginning of the 20th century. The lighthouse, which has been active since 1909 and still functions as an aid to navigation, has the original Chance Brothers 3rd order Fresnel lens which has a range of 13-15 miles. Besides the lighthouse, the light station consists of the three lightkeeper's homes, the restored blacksmith and carpentry shop and three storage buildings. One of the lightkeeper's homes is now a period museum and two are rental cottages. The Marine Science Exhibit is located in the restored carpentry shop and has a 240-gallon saltwater aquarium. Point Cabrillo is a lovely spot to explore even without the lighthouse. There are harbor seals that often rest on the rocks offshore, and sea lions swimming around. The Point is a great spot to watch Gray whales from December into April. Humpback and blue whales can be seen occasionally in the summer and fall. 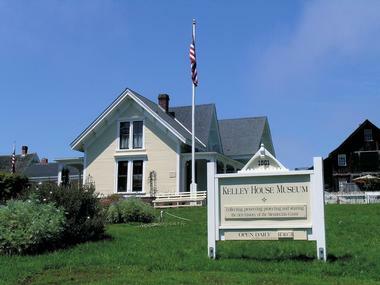 Overlooking the ocean, the Kelley House Museum was built for the affluent Canadian Kelley family that settled in Mendocino at the end of the 19th century. Restored and converted into a museum, it has a mission to preserve local history and guard the precious cultural heritage and architecture of the Mendocino coast. The Kelley House Museum is richly furnished with period pieces from the late 1800s, many of which belonged to the Kelley family. Besides the house itself, the museum has several other permanent exhibits: A number of artifacts and materials from the shipwreck of the Baltimore Clipper Frolic, which sank in 1850 near Point Cabrillo Light Station; the “Then and Now” exhibit, which shows photos of the same spot in Mendocino photographed about 100 years apart; and a Native Americans Exhibit about the Pomo people, who lived on the Mendocino Coast thousands of years before Europeans settled it in 1850. 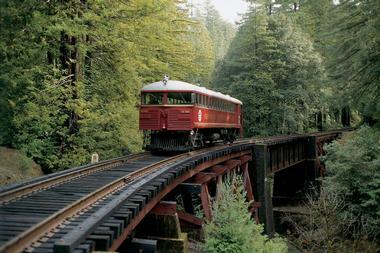 Riding a Skunk Train through the stately California redwoods, you can easily imagine workers taking the same ride along with the enormous redwood trunks on the way from the backcountry to the Mendocino mills. Called skunks because of the pungent fumes created by the engine and the heating stoves, this classic train is back in business, this time taking visitors on a four-hour-long nostalgic trip through the majestic redwood forests, beautiful mountain meadows, and 30 trestle bridges crossing the crystal clear mountain rivers and brooks of Northern California. Just like in the late 1800s, the train goes 40 miles between Fort Bragg and Willits, allowing the passengers of the restored historic rail cars to enjoy the view pretty much the same as in the late 1800s. 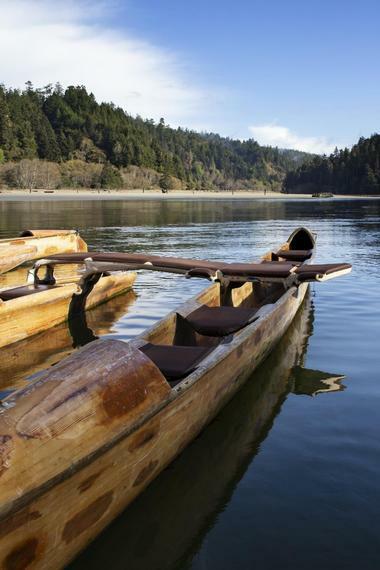 Van Damme State Park is a 1,831acre park near the town of Little River in Mendocino County. 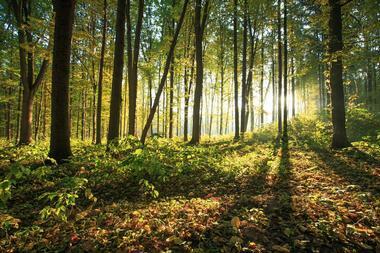 On the inland side, the park has numerous hiking trails that wind along the Little River, and some superb campsites. On the oceanside, there is a Little River beach, which is a launch point for kayaks. Some kayak tours take visitors to the sea caves nearby. Also part of the park is Spring Ranch, a 160acre meadow on top of the bluff north of Little River. The ranch contains several restored 1860 barns. A boardwalk trail goes through a Pygmy Forest, with amazing stunted pine trees, cypress and rhododendrons, which had to survive on the poor soil of the marshy habitat. 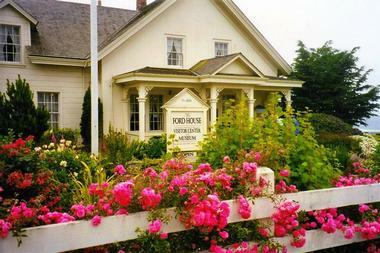 The Ford House Museum is located on Main Street in Mendocino and it serves as the official Visitor Information Center for both the town and the Mendocino Headlands State Park. Built in 1854, the charming building is home to the historic and contemporary information about Mendocino and the area around it, offering brochures, books, maps, cards, gifts and videos. Videos cover such topics as the early 20th century steam whistle logging and the fascinating story of the migration of gray whales. The Museum organizes seasonal exhibits on local flora and fauna, such as whales, wildflowers, and mushrooms. In March, visitors can enjoy whale watching walks. 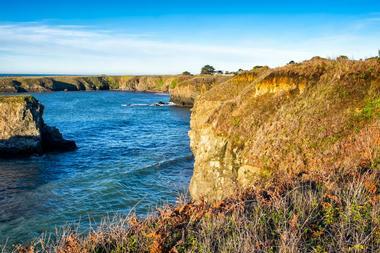 Russian Gulch State Park is a beautiful coastal reserve with nearly two miles of rugged beaches, a heavily forested gulch, a collapsed sea cave known as The Devil's Punchbowl, and endless opportunities for lovers of the outdoors. The state park permits camping, hiking through its redwood and conifer forest, horseback riding, and biking along its three-mile paved bike trail. The craggy headlands are a gorgeous place for picnics, and the blue Pacific is perfect for swimming, scuba diving, kayaking, and canoeing. 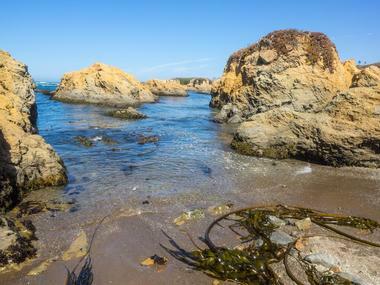 Visitors to the park may observe sea life in miniature in the countless tide pools dotting the shore, can try their hand at geo caching, or dive for abalone. The park is home to birds and animals, and keen eyed visitors may view sea birds, shore birds and aquatic mammals. 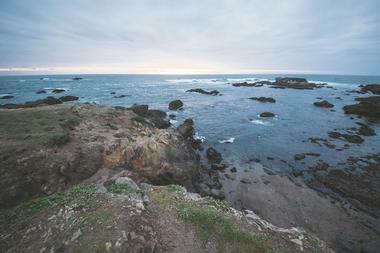 Mackerricher State Park is located three miles north of Fort Bragg on Highway 1. This gem of a park has beaches where harbor seals sun themselves on the rocks, headlands upon which to picnic and watch migrating gray whales, a lake and wetland system that is home to mallards, cormorants, and herons, and forests of shore pine and Douglas fir where black-tailed deer, raccoons, gray foxes, and mountain lions reside. Visitors to the park may camp overnight, hike or jog its network of trails, ride their bicycles along an old seaside logging road, or enjoy the wide variety of flowers on its pristine sand dunes. The park has wheelchair accessible nature trails, and beach wheelchairs for rent. The Little River Golf Course is a nine-hole coastal links that is part of the property of The Little River Inn. Visitors are welcome to play the course, and cart rentals and club rental are available. Established in 1957 by the original owner of the inn, the golf course winds through an Audubon certified sanctuary, and it is not unusual to see deer and other wildlife on the course. 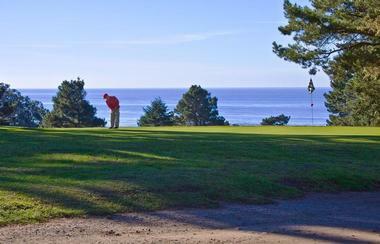 The course is encircled by redwoods and pine trees, and has dramatic ocean views. The 5,548 yard course is the only golf course on the Mendocino coast. Both private and small group lessons are offered, and both one-time visitors and annual members play the course regularly. The history of Mendocino village is very closely linked to the history of the Mendocino Art Center. When the Center opened its doors in 1959, it brought a fresh, creative spirit to the sleepy coastal village and put it on the world map. The Art Center became the spark that created a thriving art colony on the grounds of the former Preston mansion, perched on the bluff overlooking the rugged coast of the Pacific Ocean. The Center became a haven for creative spirits and a renowned educational and artistic institution that offers over 150 retreat-style classes every year in fine arts, ceramics, sculpture, fiber arts and jewelry. The Art Center offers classrooms and studios for about 200 workshops every year, attended by more than 1,200 students. The Center organizes exhibitionsthat provide opportunities to both emerging and established artists to showcase their works. There are twelve apartments for artists in residence, instructors and students. The beautifully landscaped grounds are home to many native plants and the Zacha Sculpture Garden. Jug Handle State Nature Reserve, named for the creek that runs through it, consists of a pristine, quiet beach, and a nature walk that is a must-see for anyone with an interest in geology. The park contains five levels of terraced coastline, carved out by the action of the waves through millions of years. A looping 2.5 mile nature trail allows visitors to see the sea terraces, and to admire the stunning view of the Pacific Ocean crashing into the rocks below. Visitors may also like to visit the Pygmy Forest, which has dwarf shrubs, cypresses, and pine trees only a few feet high despite being over 100 years old. The high bluffs of the nature reserve look out on the magnificent coastal scenery, and at night, visitors can view phosphorescent algae glowing on the waves. 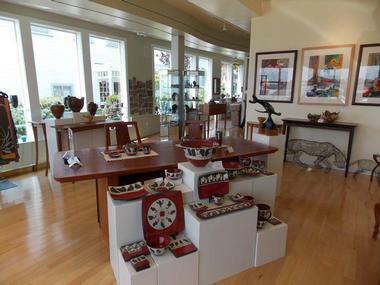 The Highlight Gallery is an excellent art shop in Mendocino that features high-quality art works by over 200 artists, both local and nationally-known. The lovely three-story historic building is filled with light, and looks out on the Pacific coast. Visitors and locals come here to buy exquisitely handcrafted furniture, wall art, textiles, sculpture, ocean sand art, bronzes, and jewelry. Each May, The Highlight Gallery has a much-anticipated show of fine woodworking from the nearby College of the Redwoods. Artist receptions are hosted monthly. 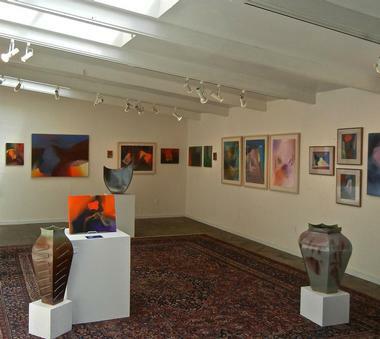 Most of the work in the gallery reflects Mendocino's Pacific coast, and the town's rural feel. 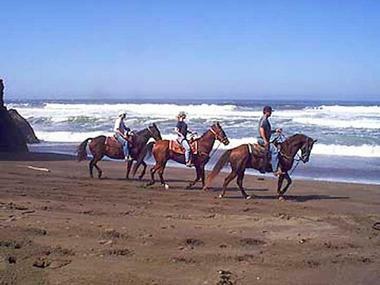 Ross Ranch is a privately-owned estate which offers horseback riding tours through a redwood forest or on a Pacific coast beach. Experienced horseback riders lead groups of up to eleven people, with horses carefully chosen to complement the rider's skill. New riders are given instruction on horse handling, and all will find that the ranch's mounts are gentle. Redwood rides go through a shade-filled inland redwood forest, and through open meadows with sweeping views of the mountain valleys. Beach rides take place on Manchester Beach, a quiet five-mile stretch of hard-packed sand that is perfect for horseback riding. Lucky visitors may spot breaching dolphins and migrating gray whales, and seals often sun themselves on the rocks that dot the seashore. The Mendocino Theatre Company draws on the talents of local actors to produce plays of substance and excitement that will be enjoyed by both locals and visitors. Established in 1976, the Mendocino Theatre Company has played over 200 different productions in the 75-seat Helen Schoeni Theatre. The small black-box theatre has excellent seating for everyone, and allows for an intimate theatre experience. The spacious theatre lobby has a full bar serving cocktails, beer, and wine, and also serves a variety of locally-made treats. The theatre company has a drop-in actors' workshops and a summer workshop program. The Temple of Kwan Tai is a 19th century joss house dedicated to the Taoist god of war, who symbolizes integrity and loyalty. In the 1850s, facing starvation at home, many southern Chinese people made their way to California to work as cooks, launderers, and water bearers for the gold rush prospectors and the logging camps. 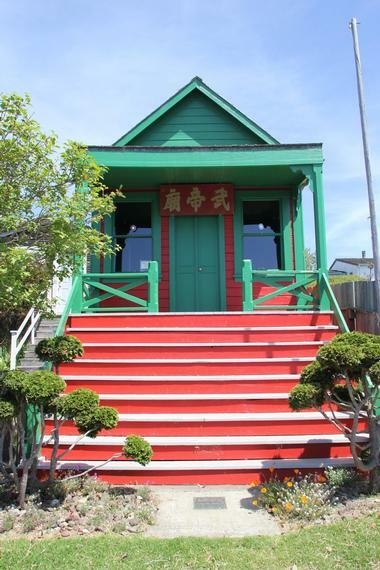 In the 1850s, Mendocino had a population of 700 Chinese people, who built this temple out of redwood, and painted it red and green. Tours are available by appointment, and are led by the great-granddaughter of one of the Chinese immigrants who lived in Mendocino. The temple, with its ornate altar and colorful decorations, is listed on the California Registry of Historic Places, and is an invaluable resource for ethnic history in northern California. 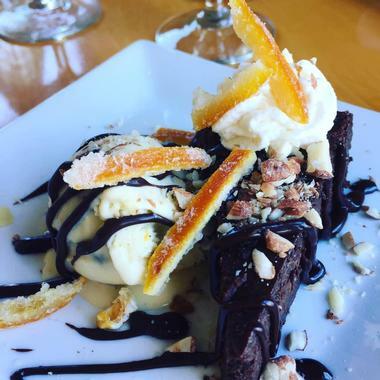 Trillium Cafe is a cozy restaurant and inn in Mendocino, offering convenient walking access to the city's beachfront, Main Street shopping attractions, and the spectacular Mendocino Headlands State Park. The restaurant, which was opened to the public in 2014, offers a fireplace and a seasonal outdoor deck with gorgeous views of the Big River Bay. Delicious entrees such as grass-fed slow-roasted short ribs, fall vegetable gnocchi, and prawns with wild mushroom risotto use organic ingredients sourced from local farmers. Three guest rooms are offered above the cafe, showcasing queen-sized beds, down comforters, and free wireless internet. Two rooms offer ocean views, while a third provides views of the city's charming downtown. If you want to explore the eight-mile-long Big River tidal estuary, Catch a Canoe& Bicycles Too outfit has a kayak or canoe for you. Check out their original redwood outriggers, you will feel like a pioneer searching for new lands. Big River is Northern California's largest undeveloped estuary. It has no roads or houses, only dense forests, secluded beaches, marshes filled with life, cool streams, plenty of wildlife and abandoned historic logging sites. This unique shop works from the Stanford Inn by the Sea and rents or sells not only kayaks and canoes but also bikes, if a trip inland is what you want. Explore the popular Big River Trail or more challenging Manley Gulch. 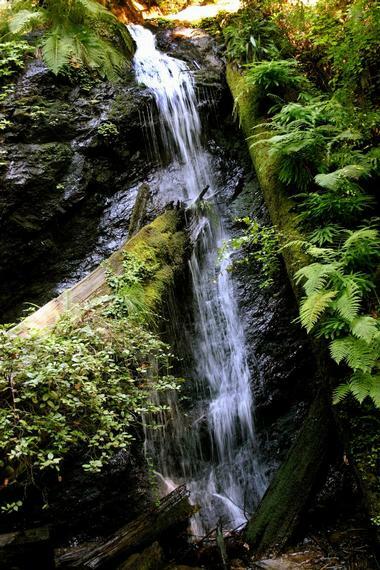 Visit the Russian Gulch waterfall, the Point Cabrillo Lighthouse or the Van Damme fern canyon on one of the comfortable hybrids that can handle even the most rugged trails. Helmets are required and provided.